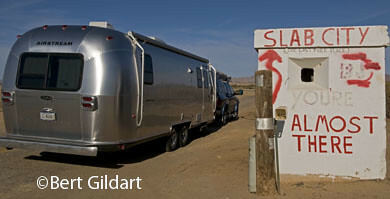 ©Bert Gildart: If you have seen the movie or read the book Into the Wild, you may recall that Alexander Supertramp, legally known as Christopher McCandless, spent time in a remote part of California called “The Slabs.” It’s surrounded by such features as Bombay Beach, a half-submerged wasteland of derelict buses and vehicles, and the Salton Sea, known for several environmental catastrophes. Sandwiched in between are the Slabs, a WWII-era Marine facility where squatters and seasonal snowbirds live in RVs and vehicles among the concrete remnants. And not far from here is Salvation Mountain, created by Leonard Knight, one of the people who befriended Alexander Supertramp. "I'd really like to show you to the top of my mountain." In the movie Knight played himself, and when I asked Knight about Alexander he said he thought he was a nice kid, perhaps a little confused. Realizing there was little more I might learn about Supertramp, I asked Leonard about his construction of Salvation Mountain, and an hour later, was glad I had. Leonard, I soon learned, is on the road to becoming a man of national acclaim. Several years ago, Senator Barbara Boxer said in a statement to the President that his site should be a “National Treasure.” As a photographer, that was another reason I wanted to visit. Janie and I arrived at the Slabs via a series of backcountry California roads. We passed through the small town of Niland, then several miles down a rutted but paved road passed a sign advising us we were about to enter The Slabs, providing “The Last Free Place.” A mile or so later, we passed Salvation Mountain and then we found what appeared to be a good clearing among the cholla, creosote and concrete slabs. Quickly setting up, Janie and I made the short drive back to Salvation Mountain, and then entered a compound providing access to Salvation Mountain. 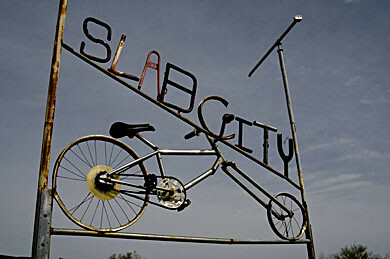 Slab City, "Last Free Place," as sign says in the small print. Before me was an older man clad in a bright red jacket. He wore no hat, had a full crop of gray hair and was sitting on a small sofa, a fixture of his great outdoor room. Here, all was back dropped by inscriptions proclaiming in various ways that God is love. We parked, and Leonard waved us over, and we soon found ourselves on a tour. I asked Leonard if he had always been a man of God and he said, “No,” that once he had been a “powerful sinner,” and slowly a bit of his story began to unfold. Leonard said that he had grown up in Vermont. He said he “should-a had a happier childhood” and that he only went through tenth grade. At age 20 he was drafted into the US Army and was sent to mechanics school. Though you'll know you're there, still, there is an official sign. Discharged from the service he said he first traveled to California in 1956. About 10 years later, he went to visit his sister in San Diego, and it was here, he said, that he experienced an epiphany that followed a period of some despondency. Leonard said he was sitting in a car one morning when he just started saying over and over, “Jesus, I’m a sinner, please come into my heart. Back home in Vermont Leonard said he had another vision, which further shaped him. He saw a hot air balloon fly over town which inspired him to work on a lifelong goal of creating a hot air balloon with the phrase “God is Love.” For the next ten years, Leonard tried to cobble together his dream, hitting up balloon manufacturers, which continued to refuse him donations. Finally, a company agreed to sell him materials which had been cut incorrectly, and so with these parts, Leonard began sewing together a giant balloon dedicated to his love for Jesus. For ten years he worked on his dream, but in the 1980s, when he was about ready to launch it from a location in The Slabs, he found the materials in the balloon had rotted. 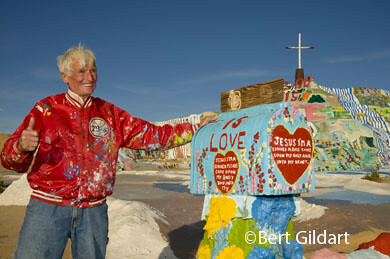 Knight said that that was the start of his mountain, and since 1985, Leonard has been painting and repainting his bright Biblical messages on the sides of Salvation Mountain. 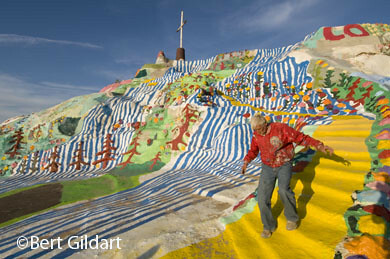 Knight descends his Salvation Mountain, following his "yellow brick road." Today, that structure is three stories tall and about 100-feet wide. He figures he has used close to 60,000 gallons of donated paint over the years, and thousands of donated bales of hay which he mixes with the adobe to harden it. Most prominent is a cross atop the mountain and from it course two streams created from a vivid blue paint. Along the way, are Biblical quotations, one The Lord’s Prayer. I then asked him what he planned to do with his creation and in response, he grew thoughtful. Leaning against his Salvation Truck (his home)–a decorated vehicle with a house on the back all decorated with biblical quotations and a large “REPENT” warning-he stared at the ground, and acknowledged that at 77 the question was one much on his mind. “Inspirational.” That may be the word that best describes the many thoughts we heard expressed about Leonard during our visit to the Slabs. Certainly, he has created an ultimate form of folk art, but his lingering contribution may simply be described by that one word. Through hard work and a vision, Leonard Knight has become a source of inspiration to many. This entry was posted on Sunday, February 22nd, 2009 at 12:06 pm and is filed under Photography, RV Travel, Travel, View Point. You can follow any responses to this entry through the RSS 2.0 feed. You can leave a response, or trackback from your own site. 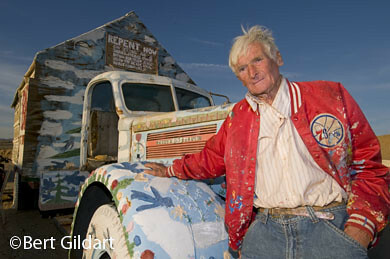 I’m creating a video about salvation mountain and the legacy of Leonard Knight. I found your beautiful pictures and would be interested in using them for our video. Please let me know if we would be able to have your permission to use them! Is this a commercial venture? Please let me know a little more about your project. Thanks for your comments.